It was cold. Brr….cold. Not the kind of bracing cold that wakes you up in the morning. This kind of cold had you wondering what you were doing out of bed in the morning. I knew what I was doing – I was about to work out and take a yoga class from Michelle Stewart, director of spa operations at The Well Spa at Miramonte Resort and Spa in Indian Wells, Calif. It was 38 degrees and the cold was a shock to locals in the desert communities. December in the desert is supposed to be a haven for those fleeing colder climes: I have friends who come from Alaska and stay four months out of the year to escape the harsh winter. The desert is supposed to be mid-80’s at this time of year with a chilly dip into the 60’s at night. 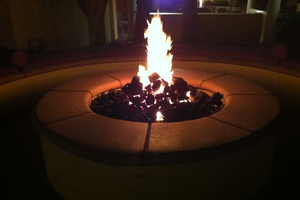 PHOTO: The fire pit at Miramonte Resort and Spa in Indian Wells, Calif. offers a cozy way to keep warm. The temperature dipped into the 30's causing visitors and locals alike to shiver. The Miramonte has a peacefulness to it that encourages guests to unwind like they would at home. 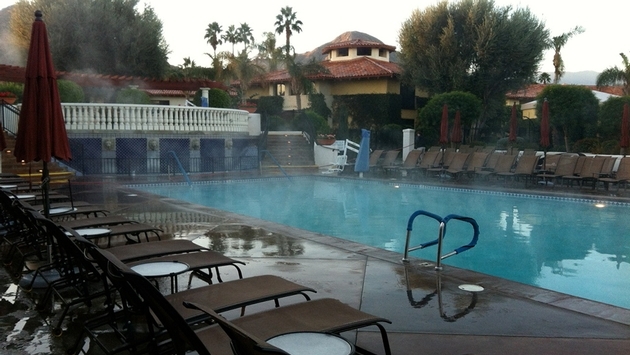 I wandered about the property looking for the yoga room, watching the steam rise off the pool. Miramonte is a homey property with 216 rooms. The view of the mountains in the background with the sun just beginning to gleam over them is impeccable. At the yoga room, Stewart had already laid out mats for the students. Despite her lofty position as spa director, Stewart teaches a yoga class for guests every Saturday morning. She is determined to keep her hand in at every level - practical, operational and managerial - at the spa. Because of her hands-on approach you might think that Stewart stood out from the others on the team at Miramonte. Actually, she blended in perfectly. Miramonte is part of the Destination Hotels and Resorts’ California Collection that prides itself on cultivating independent hotels identities. Going to Miramonte was like being adopted into a desert family. The executive management team was casual, laid-back but perfectionists. Stewart personified that attitude as she took the lead in the yoga class. Her form was inspirational. She introduced poses I never remember to do on my own, like Trikonasana, because they are difficult to do properly. Ultimately, though, they are rewarding. It was a perfect analogy for the desert. The desert is not an easy place to navigate. It’s intimidating upon first arrival. It’s big, wide-open spaces and climate can be punishing. Miramonte was the perfect place to teach you about it. The people embodied the openness. They want you to understand the uniqueness of a desert property. They want you to “get” it. That’s why Stewart led the yoga class and didn’t pawn it off to a staff member. 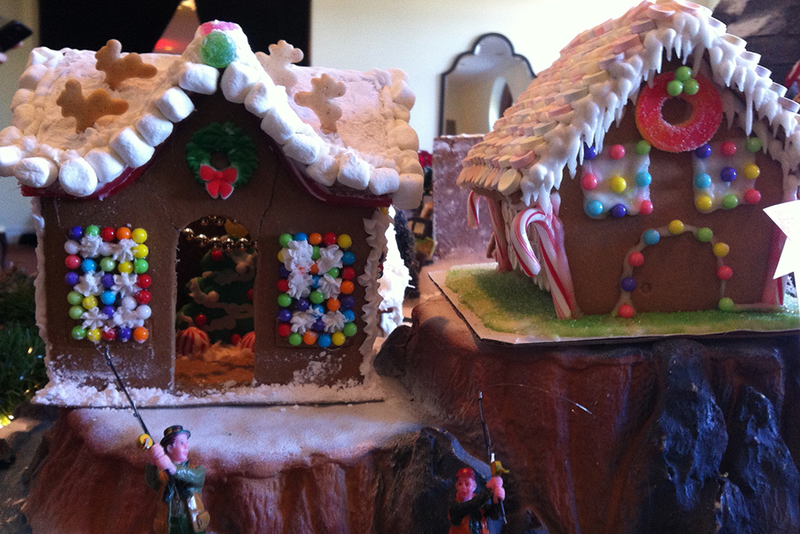 PHOTO: The Gingerbread Village at the Miramonte is an annual event that excites locals and guests. Individuals, groups or businesses purchased a lot and crafted a unique gingerbread masterpiece. There were 40 lots total and they ranged in price from $20 to $50 depending on size. All proceeds went to the local charity Desert Cancer Foundation which is dedicated to cancer patients and its families. The creative handiwork is admirable and the competition daunting. 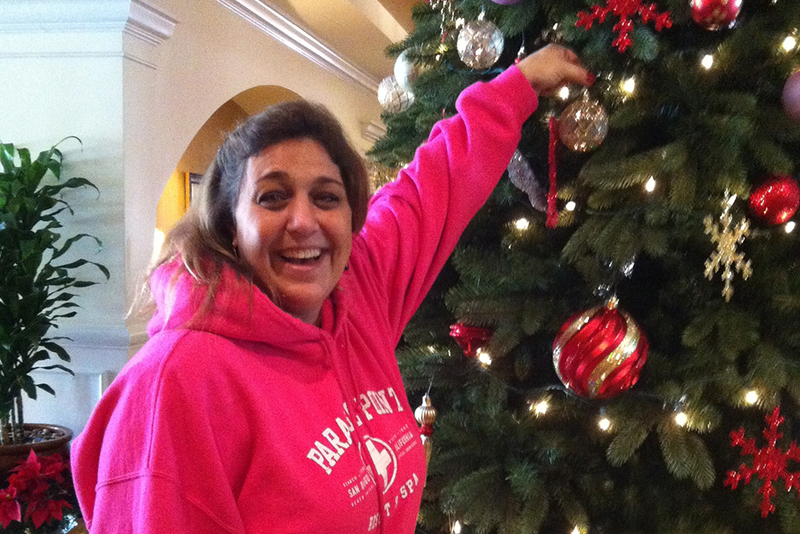 PHOTO: The Miramonte takes Santa seriously at Christmastime. 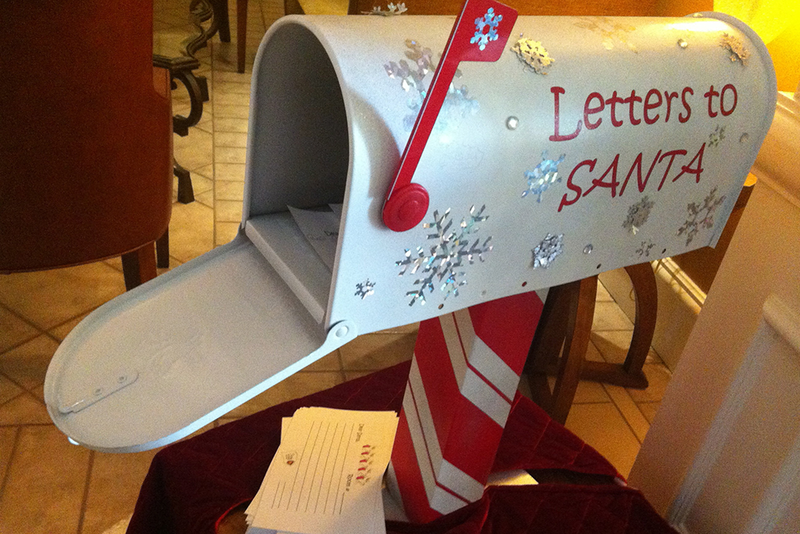 Guests with children are encouraged to fill out a letter to Santa in the mailbox located in the hotel lobby. If desired, at bedtime, Santa's elves visit guest rooms, tuck in children and read them a bedtime story. The elves reassure children that Santa will indeed receive their letter. And it’s why marketing manager Laura Hunt and her husband Gregory Little eagerly dress up as Mr. and Mrs. Claus every year to host a Christmas breakfast with The Claus’ for guests. They aren’t paid to do it. It’s just what you expect family to do. It’s all part of the Desert Holidays programming at Miramonte for 2013 that is as traditional and fulfilling as a family reunion. PHOTO: Laura Hunt Little is the marketing manager for Miramonte Resort and Spa. She and her husband Gregory Little dress up every year as Mr. and Mrs. Claus to the delight of children of all ages on the desert property. Not only do they do a breakfast with the Claus' for visitors, but they grace the employee party and even go on local radio to promote holiday events at the hotel. Stewart took the yoga work out up a notch and I was glad. I needed to work off the calories from dinner - calories that included a chocolate soufflé and a tenderloin filet that melted in my mouth akin to the pounds of melted butter in the dessert. PHOTO: Executive Chef Adam Votaw is a newcomer to the desert but not to desserts. 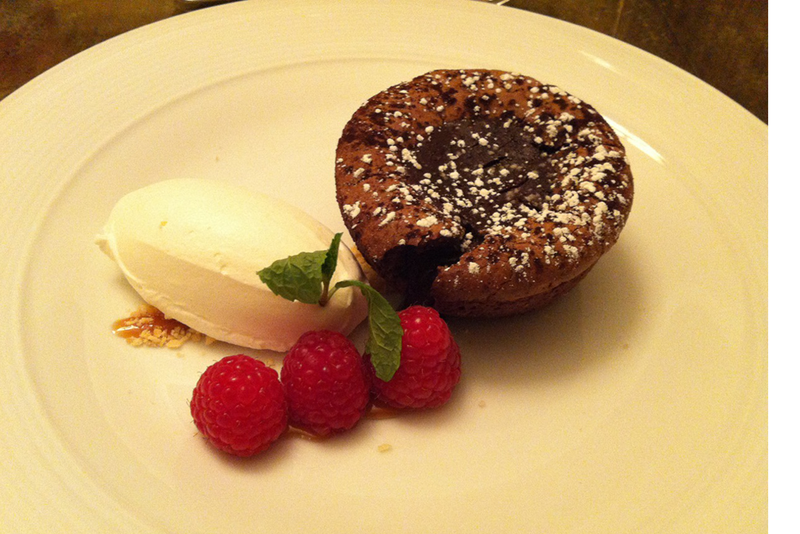 His molten lava chocolate souffle with whipped cream and raspberries will entice foodies. Executive Chef Adam Votaw was new to the Miramonte family, most recently from Sydney. Yet, he was at the dinner, sharing his newly gained perspective of the Miramonte community, taking gentle ribbing from the Director of Sales and Marketing Jim Pedone and the General Manager Stan Kantowski. They mugged for photos, the headiness of the meal prodding them on to be silly. 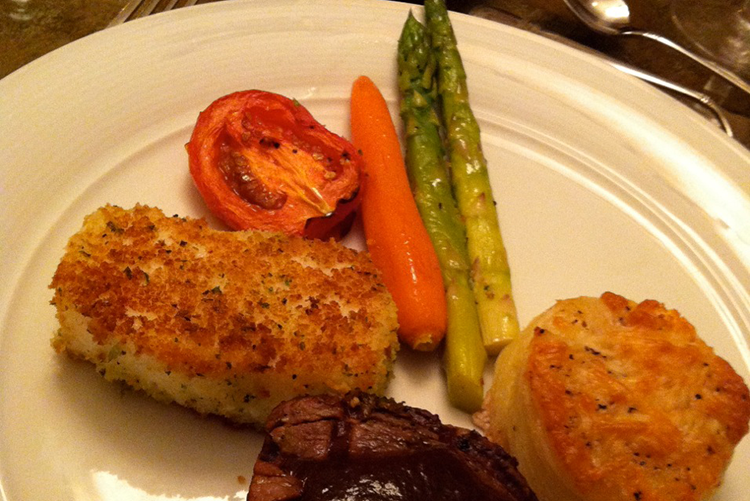 PHOTO: Whether you're a surf or turf fan, you'll want to try it all at the Miramonte Hotel and Spa in Indian Wells, Calif. The desert property just outside of Palm Springs has a new Executive Chef Adam Votaw and he's bringing his international expertise to the menu. Stewart ended the yoga class with a gentle Namaste. I breathed in the desert air on my way back to my room. It was still cold but not quite as shocking. I was warmed up, the blood happily coursing through my body. It was a beautiful day in the desert and my Miramonte family would do everything they could to ensure it would continue that way. 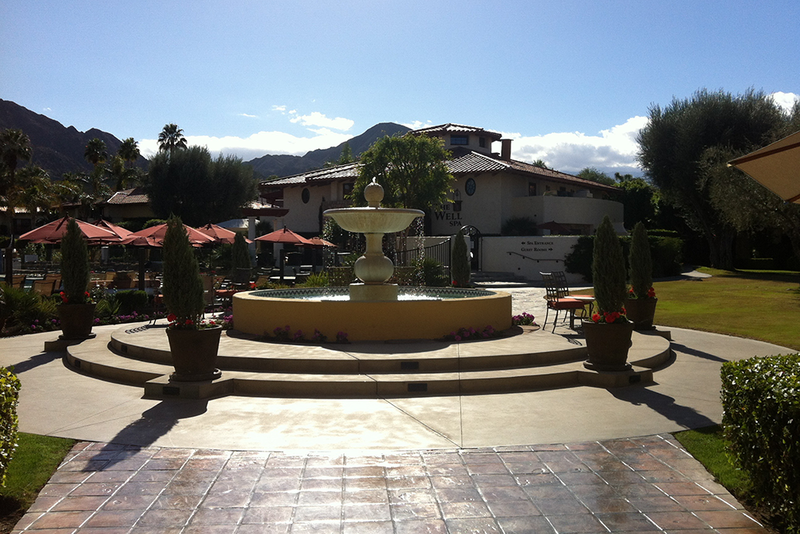 PHOTO: Beautiful Miramonte Resort and Spa in Indian Wells, Calif. enjoys the clear blue skies of the desert. Adjacent to Palm Springs, Indian Wells is a quiet desert retreat with the renowned and recently renovated club facilities of Indian Wells Golf Resort located walking distance - literally across the street.